I haven't done one of those posts where I just ramble for a bit with the hope it all makes sense in the end and someone will take something away from it, so here's the next installment of said rambles. I don't dislike change or new things, they're exciting but they scare me to no end. I'm not a shy person (dependent on the situation) but I am not overly confident either, it grows with time spent with a person. So last week I put myself head first into a new situation and went out completely on my own. AND BOY I DO NOT REGRET IT. 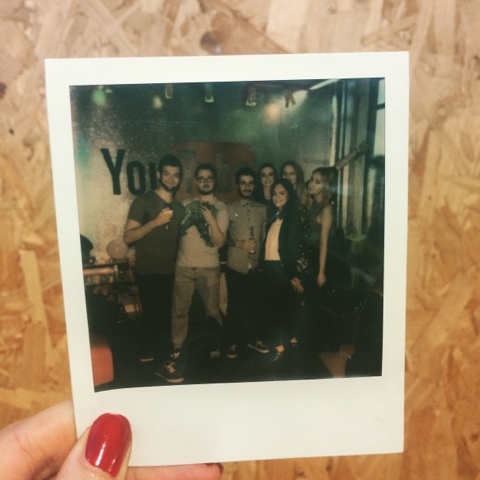 I headed to the YouTube space in London for their happy hour. Now I love these events, not only is it good for networking but making like minded friends. I ended up meeting some incredibly kind people and had one of the best evenings I've had in a long time. Once we were done at the space we headed off to the pub and the madness continued, I for one went home an extremely happy Trudy that night. As much as it's easy and safe to stay in your comfort zone, I've realised how much you may miss. If I had turned around and gone home I wouldn't have met these new found friends (sorry you're stuck with me now) so I emplore you to do one thing that is out of your safe bubble. Big or small, you'll see that it's worth it. I have missed out in the past by avoiding coming out of my comfort zone. Then I feel bad because I don't find any new opportunities or excitement! Going to my first ever blogger event next week... wish me luck! That is true!!! Im on the same journey as well, stepping out of comfort zones and pushing boundaries. My curiosity has grown and trying new things has become my new addiction!! Keep on going!!! !